A keratoacanthoma is a skin tumor caused by overexposure to the sun in older adults. 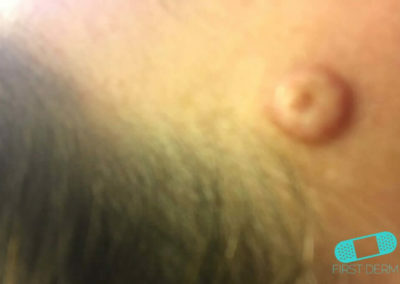 The tumor grows quickly, but unlike cancer, it usually does not spread to other parts of the body by way of the blood or lymphatic vessels or membranous surfaces. Trauma, ultraviolet light, chemical carcinogens, human papillomavirus (HPV), genetic factors, and immunocompromised status may trigger keratoacanthoma. 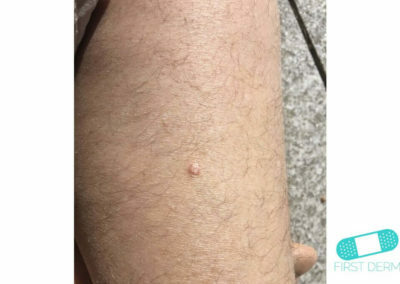 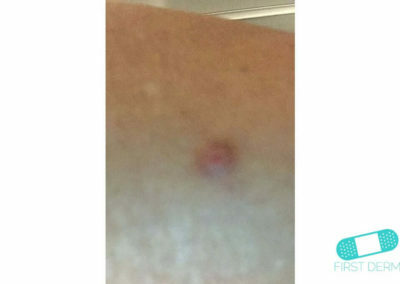 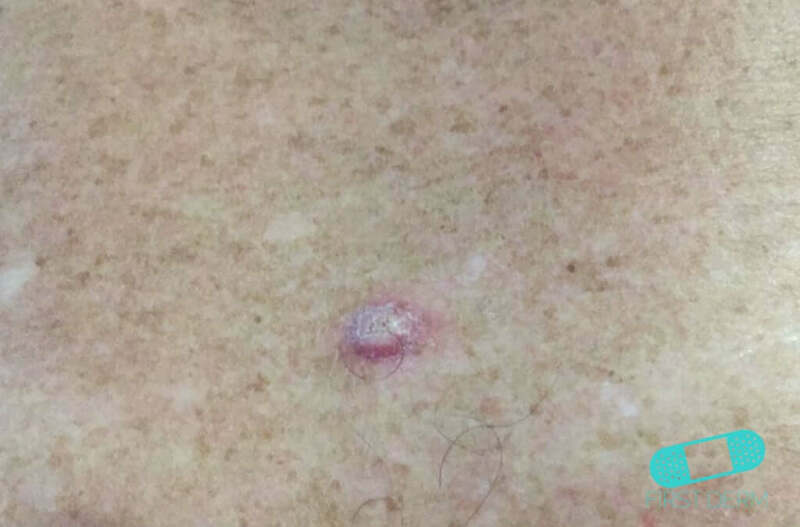 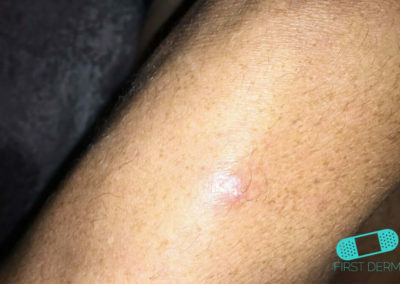 Keratoacanthoma is rare in people younger than 20 years old, and the risk increases significantly after the age of 64. 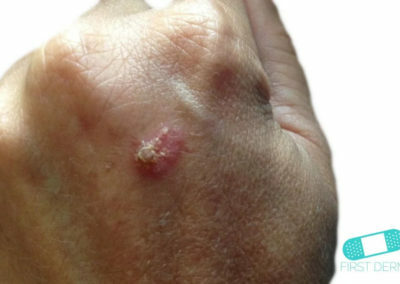 Men are twice as likely to contract the disease, and is less common in darker-skinned individuals. 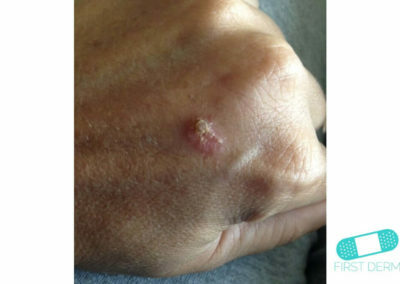 Keratoacanthoma usually appears on the face, forearms, and hands. 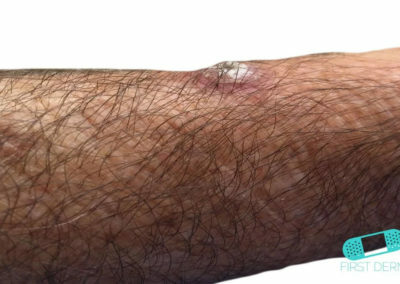 It often occurs at site of excessive sun exposure or previous injury or trauma. 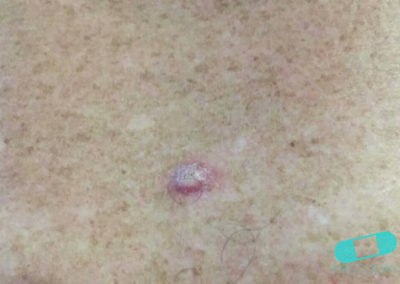 The lesion is dome-shaped and scaly, while the surrounding skin is smooth but inflamed. 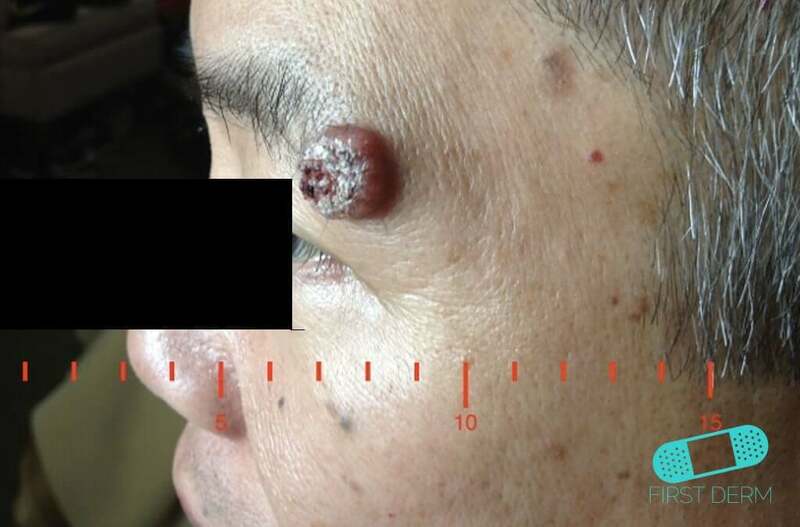 Keratoacanthoma and squamous cell carcinoma have similar features, such as actinic damage. 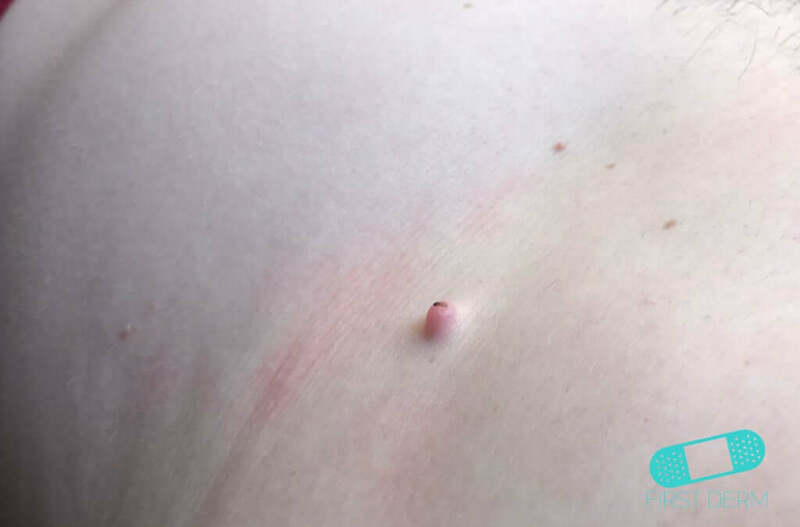 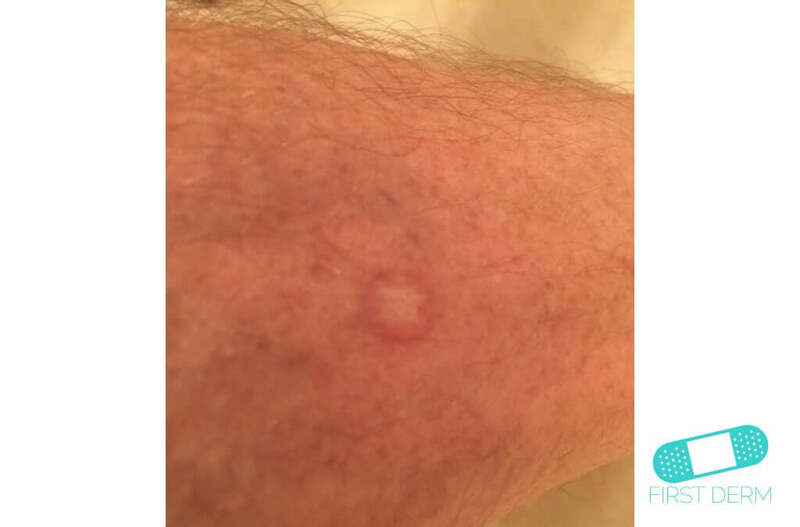 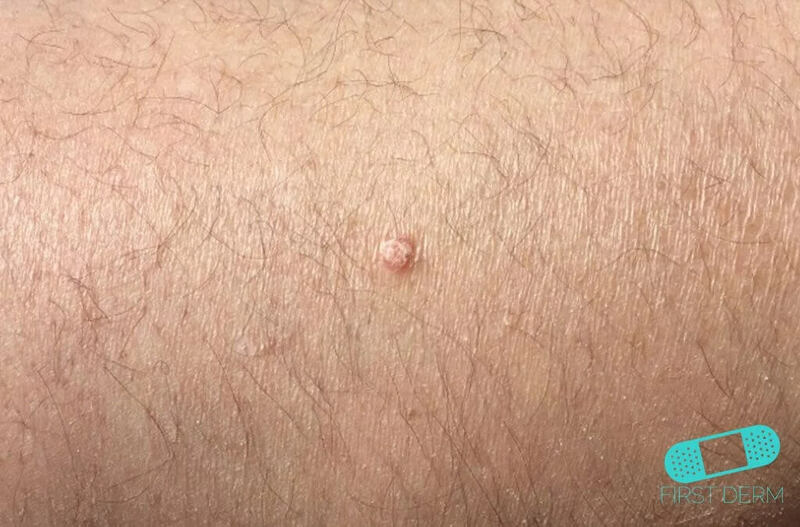 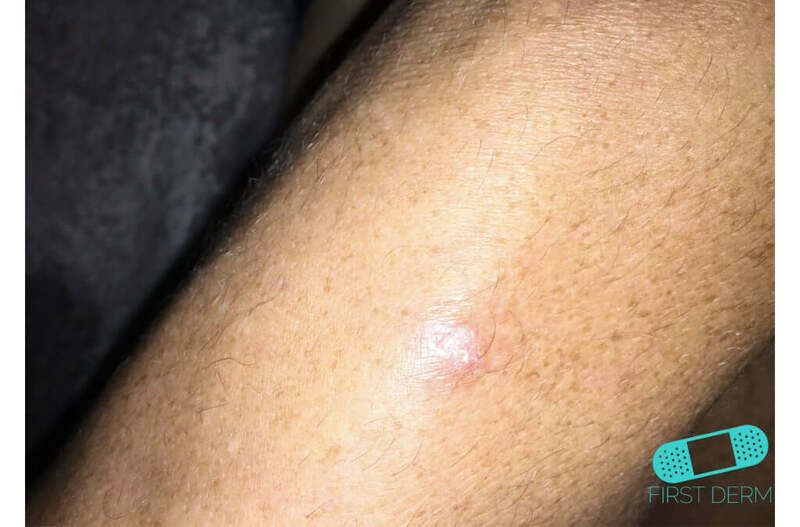 The lesion starts as a small, round, flesh-colored or red bump, and then grows rapidly on the skin from 1-2mm to 1-3cm over a few weeks. 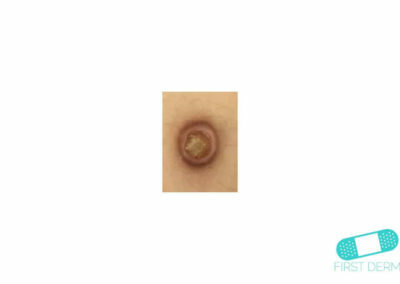 Then, it becomes a smooth dome-shaped lesion with a central core. 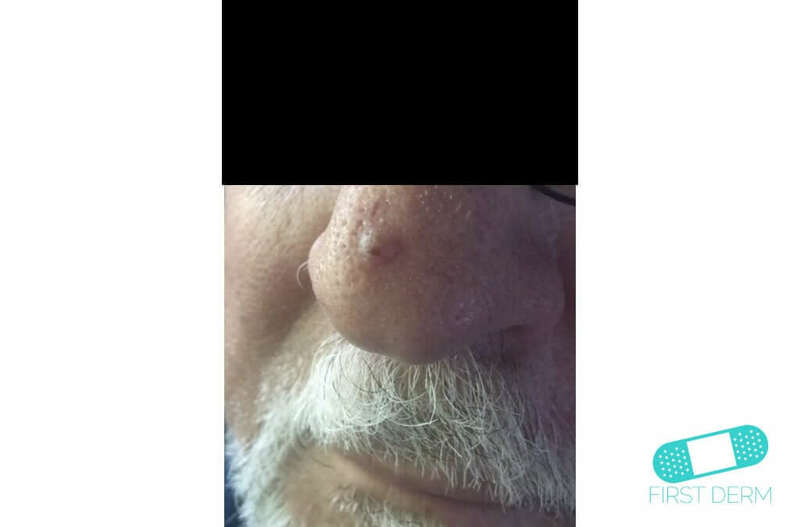 It stops growing after 6-8 weeks and remains unchanged for 2-6 weeks. 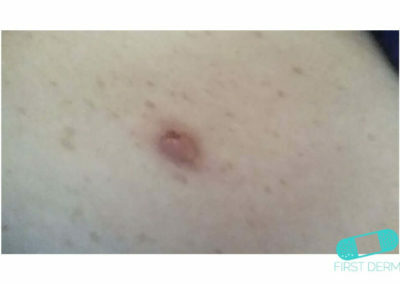 The self-healing process then begins. 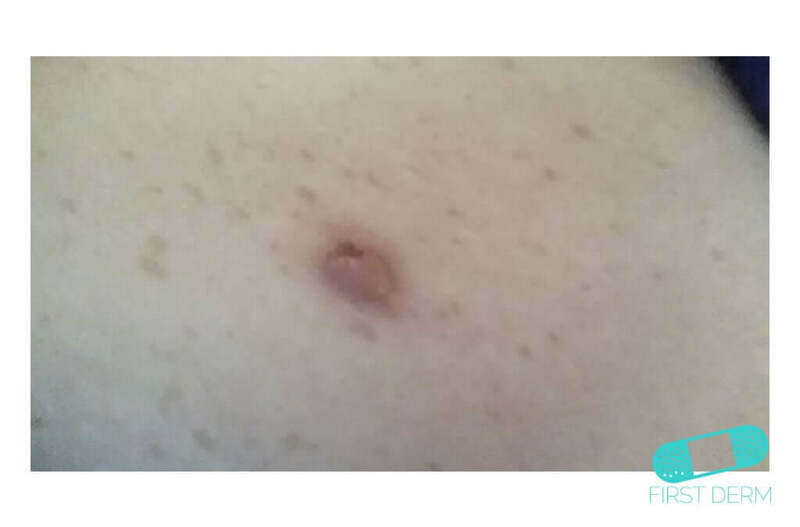 Over the subsequent 2-12 months, it spontaneously regresses and flattens and eventually leaves a scar. 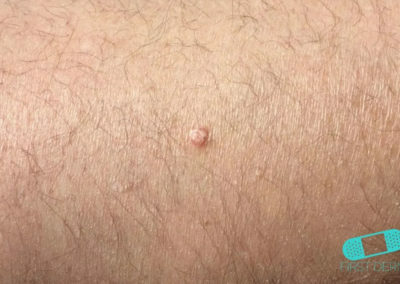 Monitor the lesion and seek medical advice if you see any change in size, color or appearance. 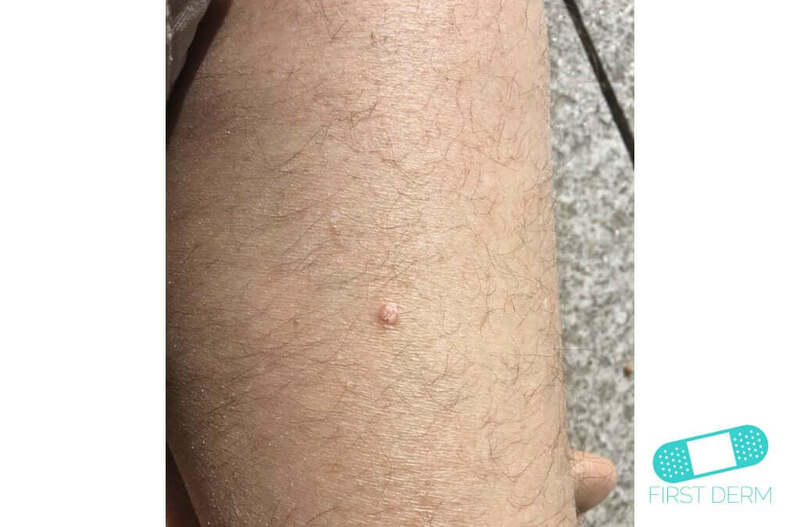 Make sure to prevent exposure to the sun. 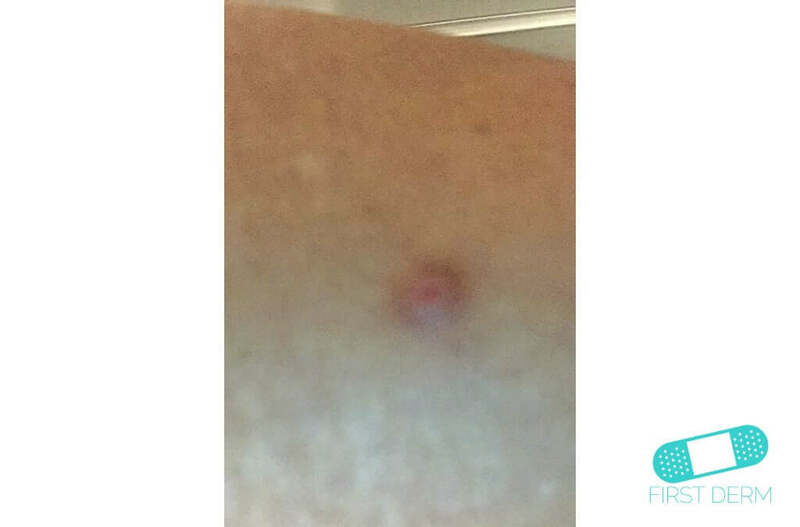 Use broad spectrum sunscreen of SPF 30+ and cover yourself up. 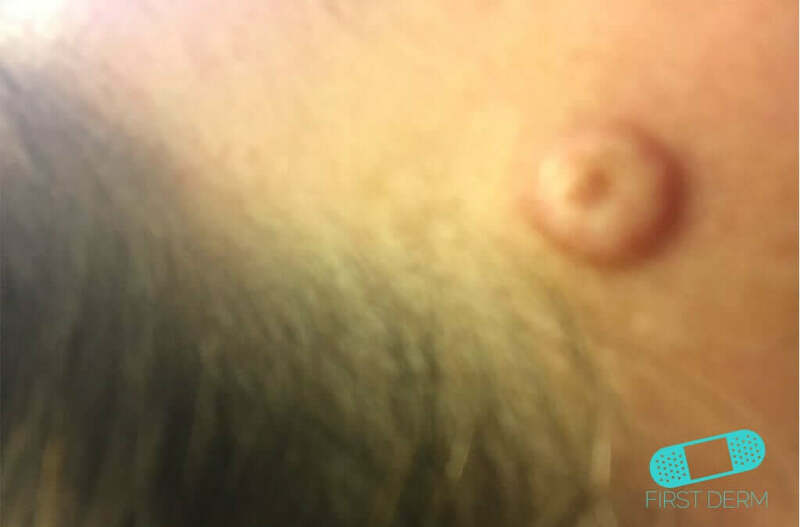 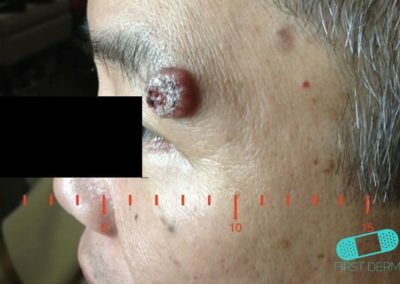  Although the tumor is benign and usually heals on its own, a keratoacanthoma can sometimes develop into squamous cell carcinoma if left untreated. 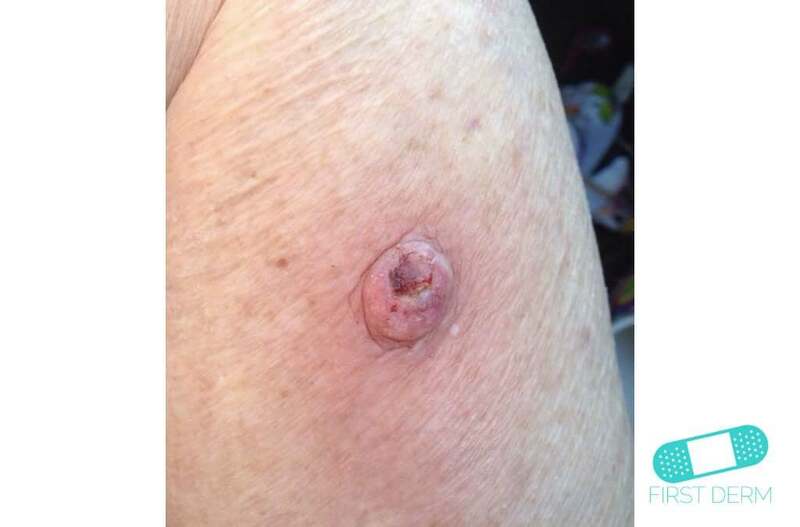 You also need a healthcare professional to determine if it is a keratoacanthoma or a cancerous growth instead. 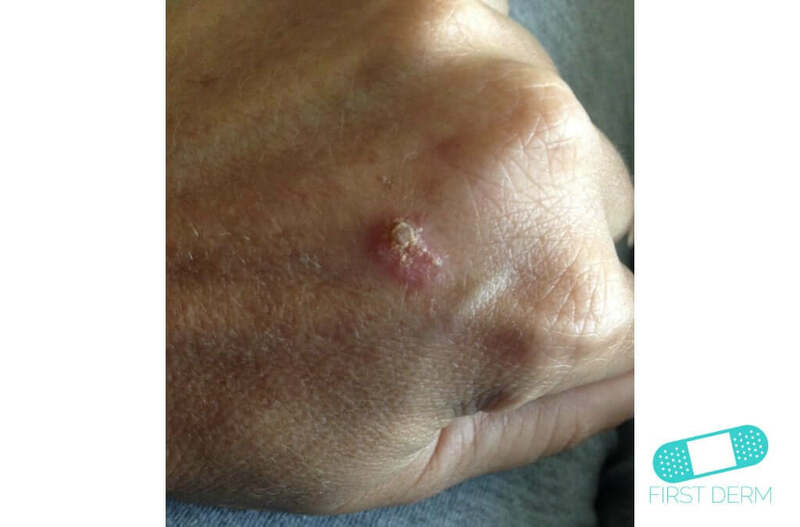 Surgical excision can remove the growth if it does not die and heal on its own. Other methods include electrodesiccation and curettage, podophyllin resin, methotrexate intralesional injections, and radiotherapy. Topical 5-fluorouracil cream applied three times a day for 1 to 6 weeks has been found to be effective. 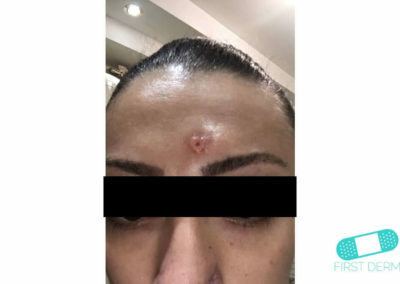 Oral isotretinoin and oral acitretin are also useful if you have multiple growths.